On June 11, 1997, the Chicago Bulls were in Salt Lake City facing the Karl Malone-John Stockton Utah Jazz in the NBA Finals, and Michael Jordan had the flu (or food poisoning). He couldn’t get out of bed until the bus left for the arena, but wound up scoring 38 points that night, sparking the Bulls’ final push to another title. The next year, against the same team, Jordan hit the step-back jumper known as “The Shot” before retiring for the second time, Mark Martin style. 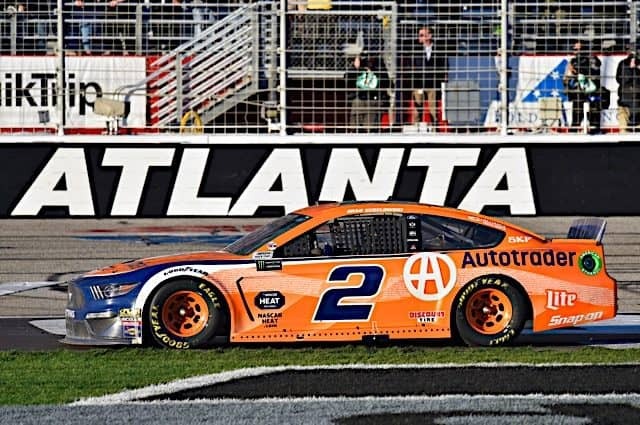 While Brad Keselowski‘s Monster Energy NASCAR Cup Series victory in the Folds of Honor QuikTrip 500 at Atlanta Motor Speedway on Sunday wasn’t anywhere near as important as either of those Jordan highlights, the win was very comparable to the Flu Game, as my Frontstretch colleague Michael Massie noted on Twitter. Keselowski earned the Ford Mustang’s first Cup victory after battling the flu all weekend, so bad that his Team Penske teammate Austin Cindric practiced the No. 2 on Saturday and took care of his pre-race commitments. Then during the race, he had to overcome a broken jack on pit road, an overheating engine and badly worn out tires to hold off a charging Martin Truex Jr. in the final laps. Keselowski’s 28th Cup victory likely punched his playoff ticket, but it also was his 60th win for Team Penske, making him the storied organization’s all-time winningest driver, surpassing the record held by sports car and IndyCar legend Mark Donohue, who earned Penske’s first NASCAR victory at Riverside in 1972. Kevin Harvick didn’t dominate like he has for most of Atlanta’s recent past, but he and his Stewart-Haas Racing teammates had a very solid day. Harvick was fourth after winning the second stage, Clint Bowyer was fifth, Aric Almirola was eighth and newcomer Daniel Suarez earned his best Cup finish at the track in 10th. For the second week in a row, BJ McLeod was involved in a wreck on pit road, as the Rick Ware Racing driver pretty much stopped the No. 52 on pit road, where rookie Ryan Preece plowed into him. McLeod finished 32nd in the 37-car field, while Preece was saddled with 35th after an immediate trip to the garage. 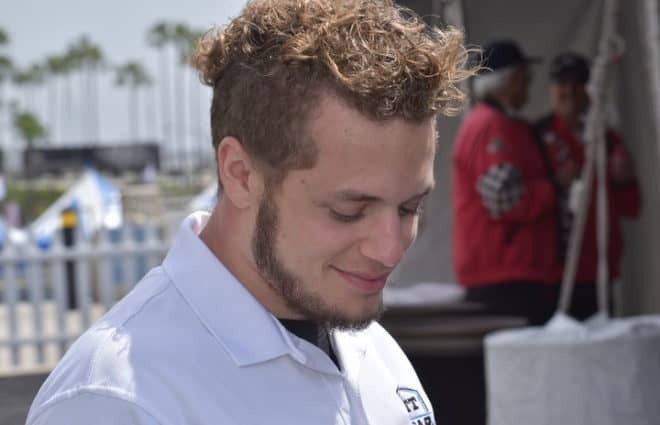 McLeod’s team didn’t fare much better on Saturday in the Xfinity race, as Matt Mills was nine laps down in 30th in a 37-car field, Tommy Joe Martins 31st and Vinnie Miller 32nd with a transmission problem. Kurt Busch and his brother Kyle Busch both scored top-10 finishes, Kurt third and Kyle sixth. The sibling Cup champions were both making landmark starts, with Kurt, the longest-tenured driver, making his 650th series start dating back to September 2000, where he’s totaled 30 wins, 27 poles, 138 top-fives and 281 top-10s. Kyle’s amassed 500 Cup starts since March 2004, where he’s logged 51 wins, 31 poles, 184 top-fives and 271 top-10s. Richard Childress Racing had a rough day. Austin Dillon qualified well in 10th, but was never a factor and finished 21st. His rookie teammate Daniel Hemric was running well, hanging around the top 10 before late damage to his quarter panel relegated him to a 20th-place result. 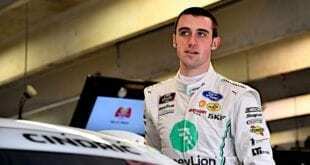 Alliance teammates Ty Dillon (Germain Racing) and Bubba Wallace (Richard Petty Motorsports) turned in finishes of 25th and 27th, respectively. 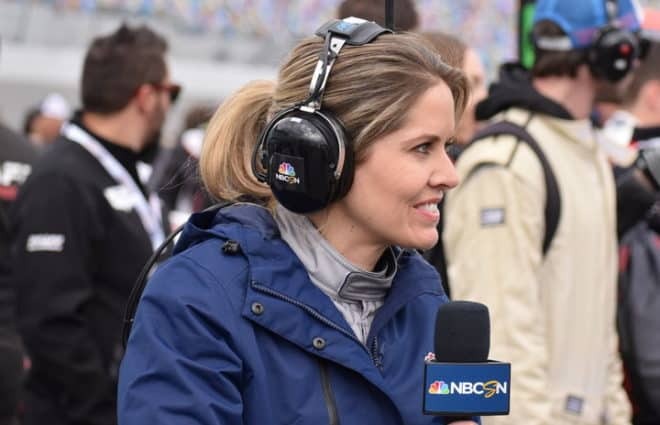 JTG-Daugherty Racing is hitting 2-for-2 so far this season, with Preece’s eighth place last week in the Daytona 500 and Chris Buescher putting the No. 37 Chevy in ninth at Atlanta. That new Hendrick alliance is paying off so far. Hendrick was outclassed by Chip Ganassi Racing for most of the event, and their top car was Alex Bowman, who posted a 15th-place result. 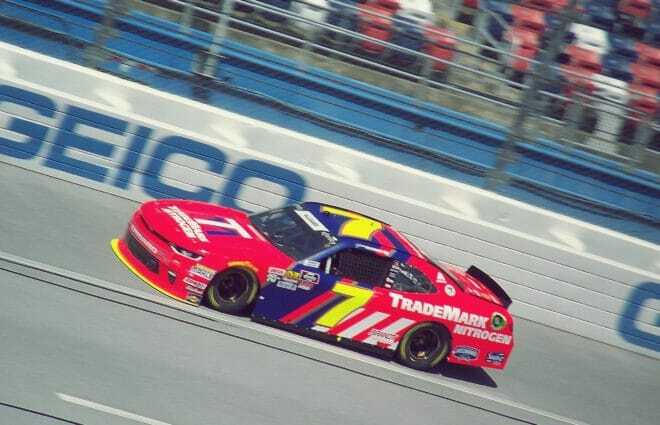 His teammates William Byron, Chase Elliott and Jimmie Johnson finished out at 17th, 19th and 24th, respectively. This was the first time Elliott ever finished outside the top 10 at his home track, and Johnson’s won at Atlanta five times in his career, posting 16 top-10s in 28 starts. For the second week in a row, Front Row Motorsports welcomed a new sponsor to the sport this week on David Ragan‘s Mustang. Last week Select Blinds made their debut, and this week the No. 38 was in the black and yellow colors of FireAde, which is a company that makes fire extinguishers and assorted accessories for both the professional and consumer markets. It’s a sharp-looking car, classy yet understated, and Ragan drove it to a very solid 16th-place finish. 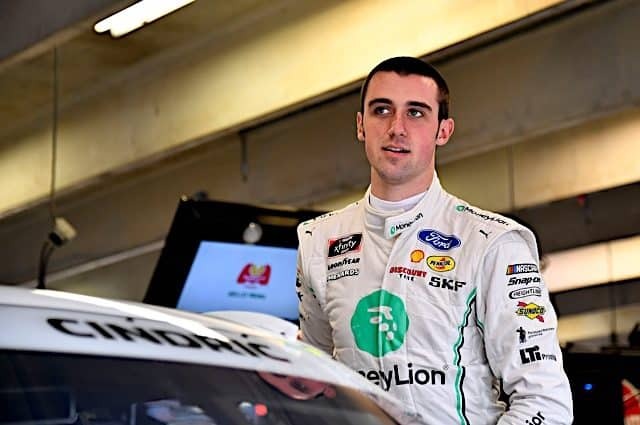 When a fan complained on Twitter about how slowly the cars seemed to be going, Ryan Blaney felt the need to reaffirm how difficult the drivers’ task is. It looks like even on the virtual track, JTG-Daugherty is on a roll, too. So far, we've had two top-10 runs with our @iRacing drivers @Christian_C37 and @NickOttinger. On the real track, @Chris_Buescher and @RyanPreece_ have each scored top-10 runs in 2019. All three national series go to the Nevada desert for a tripleheader at Las Vegas Motor Speedway this weekend. The Gander Outdoors Truck Series race will be entertaining, though probably a crashfest. Johnny Sauter has been strong in his return to ThorSport Racing, and should be a contender again on Friday night. Christopher Bell will sail away from everyone else in the Xfinity race, unless one of his teammates can keep up with him. 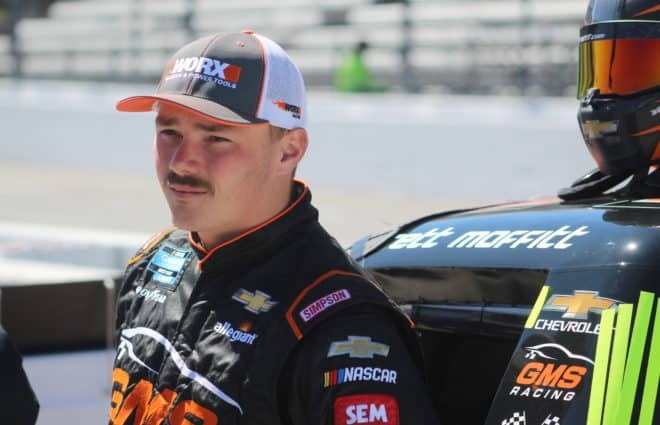 John Hunter Nemechek might be able to pull off an under-the-radar top-five at his team’s home track. The hometown favorite Busch brothers should battle with Harvick, Joey Logano and perhaps Truex and Kyle Larson for the win. 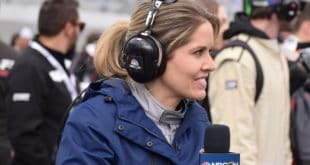 The full new rules package will be used for the first time, so whatever happens, it should be a preview of what to expect from the rest of the season. That will be something to keep an eye on. The Pennzoil Oil 400 will go green Sunday, March 3, at 3:30 p.m. ET on FOX. 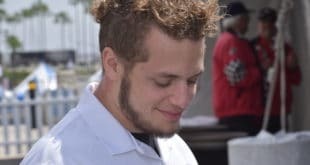 I am in the (very, very small) group that agrees with McLeod – there would have been no accident if Preece had been watching where he was driving, rather than glancing elsewhere (does this sound familiar to those who hate drivers that text while driving?). Regardless of what a leading car is doing, the trailing car has no right to plow into a car ahead; even more aggravating in this instance was the trailing car not watching the road. This incident does raise the question if Nascar has ever considered using a heads up display of the tachometer on pit road. I do not go to racing websites for medical information; nevertheless, I am amazed at the number of writers, and people, who use flu to describe apparent stomach/gastrointestinal ailments. To me, flu means influenza (as in flu shot) and means a 5-7 day stay-in-bed with a fever and cough illness (I have never read that a flu shot will protect anyone from a self-limited vomiting and diarrhea illness or protect anyone from a cold). Kes had what one writer described as a stomach bug (which I assume is a euphemism for a vomiting and/or diarrhea kind of illness, with maybe a concurrent fever). The term flu to mean influenza and also to mean other diseases may not seem like such a big deal, but to me, flu, or influenza, is an illness that can, and does, kill kids and old folks; a self-limiting gastroenteritis or a simple cold, on the other hand, are not the same as influenza, and are usually not consider lethal diseases. Pedantic much? That’s just been beat to death the last few days. You get the prize for the longest most drawn out rant of them all! For an award I’ll give you a bottle of PeptoBismol, I hear it’s great at curing “stomach flu”. LOL!